As the sun rises above the Aral Sea, Alek, a local fisherman, steers the boat, leans forward and pulls the net out of the glittering water. It is full of carp, sturgeon and flounder - just two years ago he could not have even dreamt of this catch. "All thanks to the dam," Alek grins as he throws the fish into a growing pile on the bottom of his rowing boat. The dam is part of a $68m project, initiated by the Kazakh government and financed by loans from the World Bank. It is an ambitious undertaking that aims to reverse one of the world's worst man-made environmental disasters and bring back the sea which many predicted could never return. "The Aral Sea did not die, the Aral Sea was murdered," said Nazhbagin Musabaev, the governor of the Aralsk region. Mr Musabaev remembers how in the late 1960s the Soviet government held a plenary session in the Uzbek capital Tashkent, during which the Deputy Minister of Irrigation and Water Resources of the USSR talked about the government plans for boosting the region's cotton production. The two main Central Asian rivers Amu Darya and Syr Darya, he said, would be diverted to irrigate the cotton plantations in Kazakhstan and Uzbekistan. "But what will happen to the Aral?" someone from the audience shouted. "The Aral," the deputy minister responded, "will have to die off gracefully." But the death of the Aral was far from graceful. As the water-starved sea shrank, the desert spread, changing the climate, destroying the eco-system, eradicating entire species and forcing thousands of people to flee. Every year fishermen would have to travel further and further to get to the water, and every year there would be less and less fish left to catch. Desertification and rising salt levels in the shrinking sea brought salt storms. Diseases, like anaemia and cancer, swept through communities. By the 1990s the world's fourth largest inland body of water had shrunk to a quarter of its size. Today, dropped in the middle of the grey desert is the village of Dzhambul, once home to a thriving fishing community. 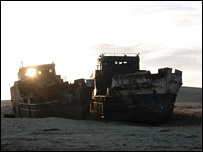 Dotting the area, which was once the deepest point of the Aral, are skeletons of rusting ships. Next to them, camels graze on the colourless dry grass that pokes out from the grey sand. 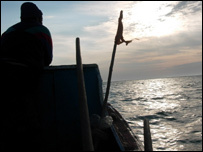 Jalkasbai, a fisherman from Dzhambul, remembers the days when life here was very different. "All my childhood I was going fishing with my father and my brothers, but my sons grew up without the sea," Jalkasbai said. "But now, I hope my grandchildren will have a chance to become fishermen." It is a six-hour drive across the desert to get to the place that has given Jalkasbai, and thousands like him, hope for the future. 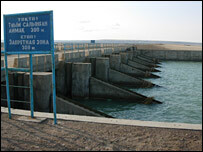 The recently constructed 13km dam has split the Aral Sea in two parts. The dam did not solve the entire problem. On the Uzbek side the Southern Sea continues to shrink. "The Uzbek government needs to hurry if they want to preserve at least some of the sea," Mr Musambaev said. But he added, that was no longer Kazakhstan's problem. In Kazakhstan, the dam has allowed the river to feed the northern Aral and as a result the sea has been pushing back into the desert. Kazakh officials say 40% of the water has already returned. The fishermen are back in their boats. The clouds and the rain have returned. A short drive away from the dam, a group of fishermen camp out in tents by the shore. Jandos Kumanov spent his entire winter here. The sea is still too far from his home village, but the increasing number of fish made the trip worthwhile. "In the last two years life has become easier," he said. "You can see fishermen are now building houses, buying cars, and sending their children to schools outside the big cities"
And it may all get even better. Using a new $126m World Bank loan, the government now plans to build a second dam, which they hope will bring the water back to the port of Aralsk. "The sea has left the harbour, but it hasn't left our hearts," reads a dilapidated sign in the dried-up Aralsk harbour. Aralsk, a grim, rundown provincial town, was once home to the biggest port along the Aral coastline. The Aral is still at least 40km (25 miles) away from the harbour, but the second stage of the project, the government says, could bring it back by 2010. This is what everyone in Aralsk seems to be waiting for. As a group of school boys climb the abandoned ships in the Aralsk harbour, one of them, an 11-year-old called Baurzhan, says he has heard about the Aral from his grandfather, but has never actually seen the sea. "But it's okay," Baurzhan said. "The sea will be back soon. That's what my grandfather says and I believe my grandfather."